American Architects, Designers of Willis Tower, One World Trade Center.  For a general guide, see: American Architecture (1600-present). World famous for its skyscraper architecture, the firm of American architects known as Skidmore, Owings and Merrill (SOM) has created distinctive modern imagery for corporate headquarters and urban areas, all exhibiting the firm's team approach to architectural design, its technical proficiencies and its vast organizational powers. Run by some of the greatest architects in the United States, the firm has extensive expertise in Architecture, Building Services/MEP Engineering, Digital Design, Interior Design, Structural and Civil Engineering, Sustainable Design and Urban Design and Planning. SOM's works have spanned eight decades of architecture, beginning with the cable-tensioned Travel and Transport Building at the 1933 Chicago Exposition, followed by the government commissioned wartime town of Oak Ridge, Tennessee (1942-46), and the dramatic Lever House (1950-52), New York. Many of the firm's designs have become icons of 20th century architecture in America, exemplifying trends such as the "International Style". Although SOM's aesthetic legacy is diverse, its former structural engineer Fazlur Khan stated its unifying theme: "Technology is our art form." SOM combines structural support, technical services, sculptural form and spatial sequence so that their unity looks strong and inevitable. Although rooted in 20th century American architecture, SOM now partners engineering groups and government agencies around the world, in order to create the highest standard of public art in a variety of building designs. The most important buildings designed by Skidmore, Owings & Merrill include: Lever House (1952) New York; Manufacturers Hanover Trust Bank Building (1954) New York; Inland Steel Building (1957) Chicago; United States Air Force Academy (1958) Colorado Springs; DeWitt-Chestnut Apartments (1963) Chicago; John Hancock Center (1967-70) Chicago; Haj Terminal (1972) Jeddah, Saudi Arabia; Willis Tower (1970-4) (formerly Sears Tower), Chicago; Onterie Center (1986) Chicago; Jin Mao Building (1998) Shanghai, China; Time-Warner Center (2000-04) New York; and the Burj Khalifa Dubai (2010) United Arab Emirates. SOM are also designing One World Trade Center (formerly Freedom Tower), New York, whose completion is due in 2013.
into the arts, see: Definition of Art. disciplines, see: Types of Art. The partnership began in 1936, when Louis Skidmore (1897-1962) and Nathaniel A. Owings (1903-84) began practicing together; in 1949 John O. Merrill (1896-1975) was made a full partner. Ever alert to renewal of talent and to continuity in its command of comprehensive design, the partnership was sequentially enlarged, with Gordon Bunshaft, Walter A. Netsch, Myron Goldsmith, Edward C. Bassett and Bruce J. Graham guiding monumental and distinguished designs from the 1950s well into the 1980s. A third generation, including David Childs, Michael McCarthy, Raul de Armas, James De-Stefano, Adrian Smith and Marc Goldstein, ascended to design major projects from the 1970s on. Other key architects have included Natalie de Blois, Brigitte Peterhans, Gertrude Kerbis, Larry Oltmanns and Lucien Lagrange. SOM engineering is embodied by Fazlur Khan (1929-82), one of the finest structural engineers of the 20th century, whose tubular structural systems continue to be used in skyscraper architecture around the world, including the John Hancock Building and the Willis Tower. Another celebrated SOM engineer is Bill Baker, best known for his unique "buttressed-core" structural system, used in the construction of Burj Khalifa (Dubai, 2010), the worlds tallest building. By the mid-1980s, 47 partners were directing more than 1,400 architects, urban planners and interior designers from offices in Chicago, New York, San Francisco, Portland, Washington DC, Boston, Los Angeles, Houston and Denver guided national and international projects often costing upwards of $250 million. During the 1990s and into the 21st century, the firm expanded its international operations, winning a series of prestigious commissions around the globe. 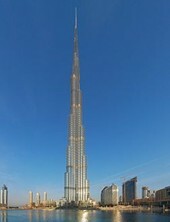 The Burj Khalifa Dubai, for instance, cost $1.5 billion. To date, SOM has completed more than 10,000 projects across America and in more than 50 countries around the world, and maintains offices in Chicago, New York, San Francisco, Washington DC, Brussels, London, Hong Kong, and Shanghai. Beginning with the urban court and thin slab of the elegantly curtain-walled Lever House and the lighted, glazed box of the Manufacturers Hanover Trust Building (1953-54), SOM/New York perfected the functional and symbolic expression of the office building, achieving elegant expressions in the PepsiCo Incorporated World Headquarters Building (1958-59), Chase Manhattan Bank Building (1957-61), One Liberty Plaza (1963), Marine Midland Bank (1967) and Park Avenue Plaza (1983). 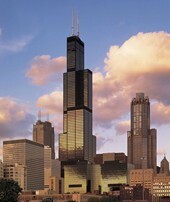 SOM/ Chicago emphasized structural expression in the Inland Steel Building (1958), the John Hancock Center (1970) and the Sears Tower (1974), soaring to 1,470 feet, with 4.4 million square feet. SOM/San Francisco gave the city the faceted Bank of America Building (1969-71), 444 Market Street (1975-81) and the Crocker Center (1982-84). SOM have also been involved highly complex large scale planning programs. One of its most important commissions in this field was acting as the lead design firm for the Boston Transportation Planning Review of the 1970s, involving a comprehensive re-design of Boston's transit and roadway infrastructure. Outside the continental United States, SOM designed the Mauna Kea Beach Hotel (1965), on the island of Hawaii, Banque Lambert (1965), Brussels, and the internationally acclaimed tented and cabled Haj Terminal (1982) at the international airport, Jeddah, Saudi Arabia. Since then, SOM have undertaken key projects in Hong Kong, Manila, Shanghai, Warsaw, London, Adelaide, Tokyo, Dublin, Singapore, Dubai and many other cities throughout the world. In contrast to the pristine calibration found in its 1950s buildings such as Lever House, as well its extensive range of buildings designed in the International Style of modern architecture, championed by Mies van der Rohe (1886-1969), Walter Gropius (1883-1969), Philip Johnson (1906-2005), and others, SOM's buildings of the mid-1980s are richly faceted forms with tubular structures rising from irregular sites and often with combinations of offices, retail shops and residences, as in One Magnificent Mile (1985), Chicago. Concern for urban context has encouraged SOM's designers to relate new forms to neighbouring buildings, as in the Federal Reserve Bank Building (1984), San Francisco. The Southwest Financial Center (1985), Miami, and the InterFirst Building (1983), Houston, gave their respective cities urban symbols derived from structural and functional premises, the hallmarks of SOM's architectural practice. Supertall building design remains a specialty of the firm. Born in the city that gave rise to the First Chicago School of architecture (c.1880-1910), and being themselves part of the Second Chicago School (c.1940-75), Skidmore Owings & Merrill have built a number of the world's tallest buildings. They include the 100-story John Hancock Center (1969) (second tallest in the world at the time), the 110-story Sears/Willis Tower (1974) (tallest in the world for more than 20 years, and still the highest building in the USA), the 98-story Trump International Hotel and Tower (2009), Chicago (the second tallest building in the USA), and the 2,717-foot-tall Burj Khalifa Dubai (2010) United Arab Emirates (currently the tallest building in the world). SOM's One World Trade Center, due to be completed in 2013, will become the tallest building in America. SOM has been awarded more than 1400 awards for quality and innovation, of which some 500 have been awarded since 1998. In 2009, for instance, SOM received four out of 13 Research & Design Awards from Architect Magazine. Back in 1962 SOM won the first Architectural Firm Award of the American Institute of Architects (AIA). Then in 1996, it became the only firm to receive this award for the second time. The AIA also awarded its Gold Medal to two of the original partners - Louis Skidmore in 1957 and Nathaniel Owings in 1983. Here is a very short selection of some of the most famous buildings designed by Skidmore Owings & Merrill. Note: SOM also assisted the Deconstructivist architect Frank O. Gehry (b.1929) in his design for the Guggenheim Museum, Bilbao.  For more about skyscraper designers and architects in America, see: Homepage.